I don’t need to sell cheese veg sandwich to you. 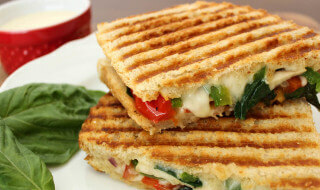 The cheese in the sandwich provides calcium, protein, vitamin A, vitamin B12, phosphorus, and zinc. Vegetables and the multigrain bread provide both soluble and insoluble fibre respectively. However, a note of caution; it is not for nothing that cheese is shunned by those trying to lose weight or those with heart conditions. So, don’t overdo the cheese. In a large bowl mix all chopped vegetables. Now add chopped chillies, coriander and mint leaves and mix well. Add grated cheese, boiled corn and mix well. Now add salt pepper, chilli flakes and chilli powder all according to taste and mix well. Heat a tawa on low flame. Slightly butter bread slices on both sides. Now apply this mixture generously on bread slice and cover it with another buttered slice bread. Now heat this on low flame on tawa till it gets crispy.